Summer is here and we are all getting very hot. Temperatures are rising to higher levels and as much as we all like the idea of having a summer baby, being pregnant in the summer is no joke. In pregnancy our bodies go through many changes as we grow our baby, the core of our body temperature is slightly higher than normal due to the hormone changes and increased blood flow, then summer comes along, yes that lovely summer heat which we all like to get out and enjoy with our close ones and reap the benefits of sunlight vitamin D. In pregnancy the summer heat can be overwhelming and I want to share a few tips on what you can do to keep cool in your pregnancy. Drink plenty of fluids. You can dehydrate easily when you’re pregnant. To help avoid this, carry a bottle of water and take regular sips throughout the day and cut back on the caffeine, which will make you feel more dehydrated. Pregnant woman should be drinking at least 8 glasses of water a day. Choose clothes with natural fibres, such as cotton or linen. These will help you to stay cool by allowing good airflow. You could try keeping covered up, this can help you to keep protected against sunburn, you’ll also feel cooler without direct sunlight on your skin. Wear long-sleeved tops in lightweight fabrics and loose, comfortable trousers or long dresses and skirts for example. Wear a summer hat that will protect your face and neck from the sun, as well as helping you to stay cool. Plan your outdoor activities for the cooler part of the day, morning or evening is the time when the sun is lower and temperatures are cooler. Carry a small plastic bottle with spray nozzle, filled with water. It’s a great way to cool down. You can store the bottle in the fridge to keep nice and cool. You can add oil/essential oils to hydrate and moisturise your skin and/or for aromatherapy benefits. Some essential oils can also help to cool you down. Put your wrists under a running cold tap or pour a little water from your bottle on to your face or the back of your neck, this can cool you down instantly. Hot weather can cause your hands and feet to swell, minimise your salt intake to prevent or reduce water retention, this can help you feel more comfortable. Excess salt encourages water retention in the body, keep your feet up as much as you can, moisturise and massage swollen areas frequently to make them feel more comfortable. Fans and air conditioning are effective ways to cool down. Just remember when you’re pregnant, it can take longer than normal for your body to adjust to any temperature changes, give yourself time to adapt when moving from one environment to another. Buy a mini fan, either a folding paper fan (which you can also make) or a hand held battery operated one. Find time to go for a swim. Swimming is also an great form of exercise in pregnancy and can help reduce any swelling in your legs, ankles and feet.. Consider a lukewarm shower or bath to give immediate relief from the heat. A cold shower may sound all good, but can actually make you hotter as your body generates heat to make up for the sudden chill. When you’re feeling hot and sticky lukewarm showers are best, as exposure to cold temperature water will constrict your blood vessels and send signals to your body to retain heat. Close your curtains or blinds to shade and cool the temperature in your house. Foods with a higher water content will have a more cooling effect such as watermelon or cucumber. Why do I need to take extra care? Sitting, walking or standing in the sun for long periods can lead to you feeling faint and dizzy, this can cause harm to you and your baby as the risk of you falling over in a compromising position or onto your belly goes up especially as pregnant women tend to feel quiet unbalanced with the extra weight gained in front of them. Scientists are concerned that heat waves could be linked to more premature births and stillbirths, learn more here: Global warming might be dangerous for pregnant women. 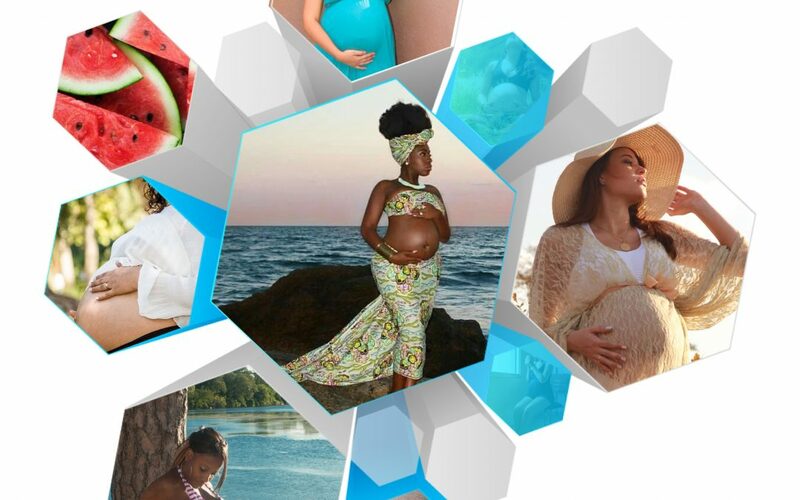 With all mentioned, I hope you find the tips on how to keep cool during summer useful and continue to enjoy your pregnancy, because you and your baby matter.